The faux fireplace area was one of my least favorite places in our house. 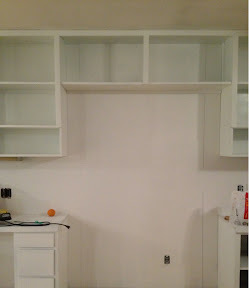 I started removing the cabinet doors to get ready for priming and then painting. We plan to leave the doors off of the upper cabinets and have open shelving. The drawers and doors will go back on the bottom part. I wanted to try to create the illusion of an entertainment surround. I removed the bottom shelf in the middle, upper cabinets. That will make room for a wall mounted TV (if we choose to put it there). This is how it looks after being painted. I'd like to try to connect the shelves down to the bottom cabinets. I'm not positive on this yet. I'm not sure how it would look to add wood to the sides all the way down to the bottom shelving. First I have to decide what to do with the tops. The desktop and the top on the other side were a laminated wood. Scott decided to just paint everything when he was spraying. This won't last and is already getting scratched up. We didn't prime it first like we did the walls and cabinets. It was a temporary fix to cover the ugly. I'd like to do something with the old, grey wood we have in the shed. It's just an idea. There are several more stages this area will go through. I'm still trying to decide what we will do in the middle. I'd like a faux fireplace ASAP, but don't want to rush it and settle for something I just like. I want something I will love. I just watched an episode of HGTV'D where Robert and Cortney Novogratz did an awesome fireplace out of reclaimed lumber for a homeowner. It got my mind churning. I've been thinking I wanted old brick with a wood surround. But now I'm not sure.